Antonis Samaras leader of New Republic (ND) and Alexis Tsipras leader of SYRIZA seem to battle for votes, according to new polls published today by the Sunday papers. Of the three polls published Sunday, two put Syriza ahead and one the conservative ND party ahead. At the same time, polls showed a decline in percentages for the following parties: Greek Independent, Communist Party, Golden Dawn and Ecologists Greens. According to the MRB poll for the newspaper ‘Real News’, New Democracy collects 20.1% of the votes, SYRIZA 19.6% and PASOK with 11.9%. Independent Greeks with 7% follow Democratic Left 5.7%, KKE 4.9%, and Golden Dawn with 4.8%. 1.6%, Democratic Alliance and LAOS 1.4%. According to the Public Issue poll for Kathimerini, SYRIZA comes first in voting intentions with 20.8% versus 19.7% of ND. PASOK on this poll gathers 14.4% and the Independent Greeks coming fourth with 6.5%. 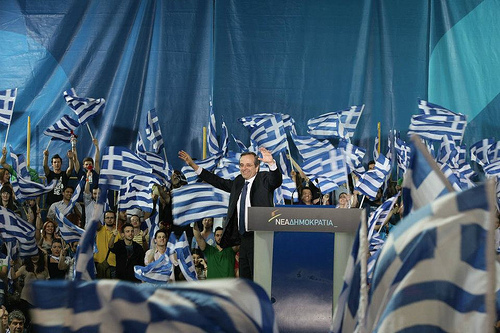 The Democratic Left collects 5.2%, KKE 4.8%, Golden Dawn 4%, Re-create Greece 2.3% and LAOS 1.5%. According to Metron Analysis poll for Protagon.gr SYRIZA collects 20.8% versus 19.7% of the New Republic. PASOK is also 14.4% while the Independent Greeks collect 6.5%, Communist Party (KKE) is 4.8% and the Golden Dawn by 4%. According to Public Issue, respondents, when asked who is more suitable for the Prime Minister’s job put Alexis Tsipras next to … “No one” with 19%, followed by Antonis Samaras 17%, Evangelos Venizelos 16%, Fotis Kouvelis 15%, Panos Kammenos 7%, Aleka Papariga 2% and N. Michaloliakos 1%.